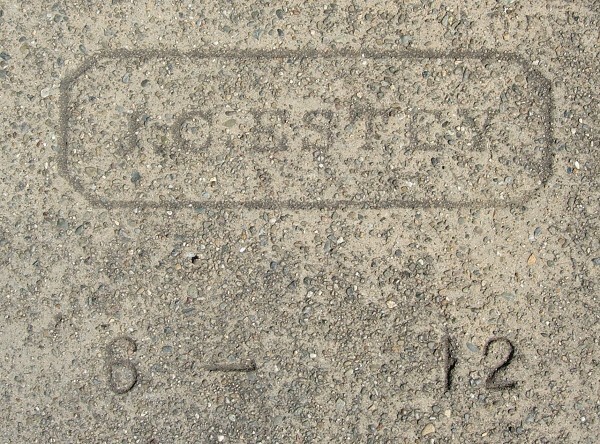 The worn, unobtrusive stamp of J. C. Estey can be seen wherever the pavement is oldest. But this man left a rich record. The 1870 census listed him as a farmer, married to the former Harriet “Hattie” Evans and father of two-year-old Minnie, living in Manhattan Township, Kansas. By 1876 he was registered to vote in San Francisco. In 1878 he was awarded a patent on a scheme to extract power from inside a water line. As of 1879 Estey had moved to Oakland. The 1880 census listed him as a coal dealer with three children, including a son Charles. In 1882 the Daily Alta California reported that he had been elected Assistant Superintendent of the Central Mission Sunday School in Oakland. That same year the Oakland Tribune reported that he was moving his coal yard to 16th and San Pablo. In 1886 he was listed as a farmer in the rolls of the State Anti-Riparian Irrigation Organization of California, living at 535 17th Street, where the Oakland Ice Center is today. He was listed as an officer in the Civil War veterans association that same year. Voter records show that between 1892 and 1896 he relocated to 458 E. 17th Street in East Oakland. In 1896 he was active in the People’s Party. The 1900 census listed him as a cement contractor, and so did the 1901 Directory of American Cement Industries. He advertised in the Tribune in 1901 as “Contractor for all kinds of Cement Work, Concrete and Stone Walls.” This is significant because it pins him down as one of Oakland’s earliest sidewalk makers. 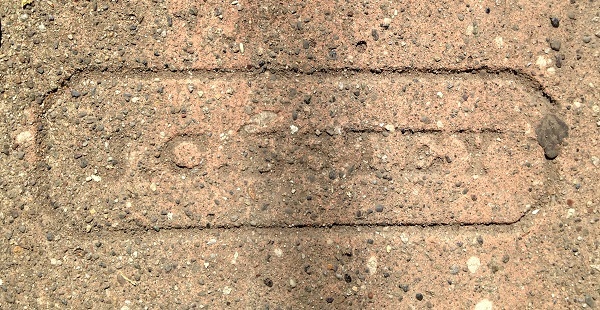 It is conceivable that some of the pavement bearing his mark dates from before 1900. However, I have found only a few dated examples, all from 1912. Baker Street, in the Golden Gate neighborhood, has a bunch of them. Estey died in 1919. I have no information on his gravesite, but he qualified for a Civil War veteran’s grave. This entry was posted on 19 May 2017 at 11:13 am and is filed under Profiles. You can follow any responses to this entry through the RSS 2.0 feed. You can skip to the end and leave a response. Pinging is currently not allowed.